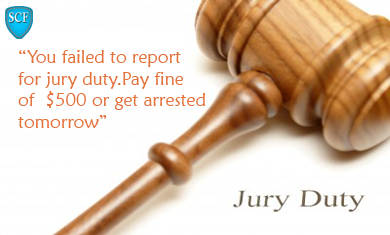 Citizens across the states have been reporting phone calls demanding a fine for not showing up for jury duty and that a warrant will be issued for their arrest, if the fine is not paid. The caller claims he is calling from the local County Sheriff's Office and to take care of the issue, victims are advised to purchase prepaid gift cards without getting off the phone! The idea is to prevent victim from meeting and talking to others. The victim is ordered to go to a nearby store, obtain the cash cards and in the guise of verification, the "police officer" would extract the PIN number on the back of the cards in order to empty them. Consumers should never make payments by purchasing gift cards or prepaid debit cards, to resolve government matters. Be wary if you are being asked to act immediately. Scammers typically try to push you into action before you have time to think. Never wire money or use a prepaid debit card when told to do so by a person that you do not know. Once it is used, you won’t get a refund. Sheriff’s Office never calls or emails citizens to advise them of warrants or jury duty. Hang up and call the local court and you would certainly be advised that the call from "Sheriff's Office" was a scam!